Drug related deaths between December 2006 and December 2012 (the darker red the higher) and transportation infrastructure (border crossings into the US, ports, railroads, and highways). Mexico has experienced a surge in violence linked to criminality, gang wars, and drug trafficking. The sharp increase in homicides after 2007 coincides with the start of President Felipe Calderon administration and his militarized campaign to debilitate drug-trafficking organizations (DTOs). In December of 2006, the government deployed 6,500 federal troops to the state of Michoacán; thereafter operations against DTOS increased, with approximately 45,000 troops involved by 2011. His polices differed significantly from that of previous administrations using a “beheading strategy” – the targeting for arrest of the highest levels or core leadership of criminal networks – as a key element of his counter-narcotics polices. On March 2009 the government released a list of Mexico’s 37 most wanted drug lords and by January 2011 the army, the navy, or federal police had captured or killed 20 out of 37. Studying Mexico’s drug war provides an opportunity to learn more about the dynamics of violence in “criminal insurgencies” and the impact of counter-narcotic interventions. These wars are different from regular civil wars in that DTOs do not seek to supplant the state but are organized to maximize profits from the trafficking of drugs. ESOC research on Mexico has illuminated some of the unique aspects about criminal insurgencies. 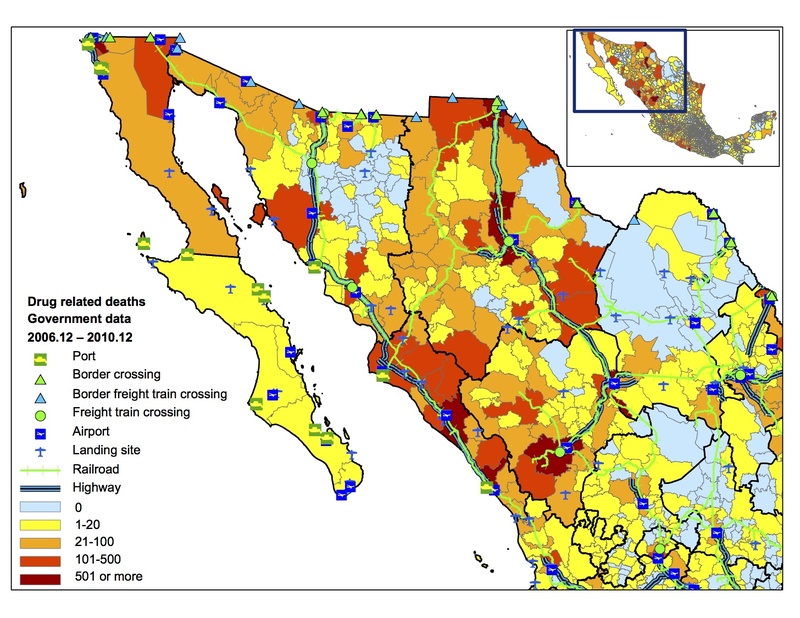 We have geo-referenced Mexico’s transportation network and find that DTO violence has a specific geographic location in territories connected to the flows of international trade –places that have ports, airstrips, airports, freight hubs, high-speed highways, or border-crossings. We have also studied the impact of government interventions and the “beheading strategy” on the escalation of violence. ESOC research on Mexico has also described the onset and duration of “local turf wars” between rival cartels erupting in 140 cities or towns across Mexico between 2006 and 2011. ESOC research has examined the economic consequences of these local turf wars and how violence and extortion affect economic growth, employment, investment, and the generation of new businesses. ESOC data in Mexico span the entire duration of the drug war since 2006 and include information on different kinds of violence, population demographics, basic infrastructure, and more.